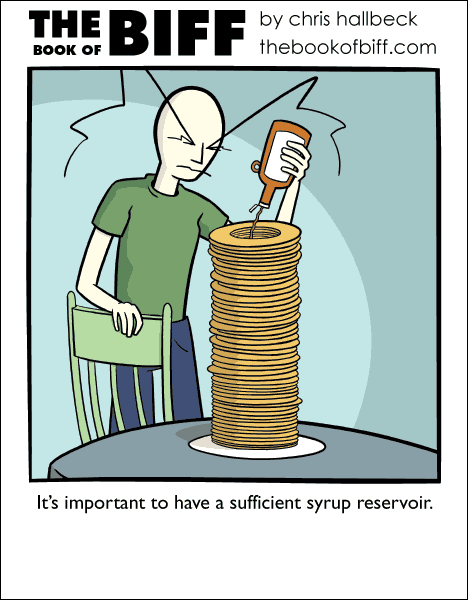 Pancakes are just an excuse to eat syrup. Rice is just an excuse to eat soy sauce and butter. Tea is just an excuse to drink lots of sugar. French fries are just an excuse to eat potatoes. Today’s Maximumble is at the end. french fries for the mayonaise. I hate maple syrup. I eat my pancakes with chocolate syrup or caramel sauce. I don’t drink tea. You don’t need to add anything to rice to make it taste good the way I make it. I agree on the potatoes though. Oh man potatoes are so tasty i every form. Forget the rest of it. Cake is just an excuse for frosting. When I was in grade school, I made a pancake tie pin holder for my dad. The top of the stack was the lid. The pat of butter was supposed to be a handle, but you just had to grab the whole pancake. Man, I hate pancakes. And syrup. Soy sauce and butter on rice? Madness. There are so many other wonderful sauces that go with rice. And I never put anything in tea, iced or hot. Pancakes: Replacement for bread when making bacon, egg, and cheese sandwishes. The pancake taco is still safe from McDonald’s. Those aren’t pancakes. There macadamia nut pancakes. Wilson made them, and they’re fantastic. Rice is an excuse to eat… butter? Tea is an excuse to drink more tea. I could make just a cup of tea, but since I’m making I might as well make a whole pot. “Rice is just an excuse to eat soy sauce and butter.” Uuuggg, who eats soy sauce and butter with their rice?? ?